Our parking lot striping & pavement marking services include new layouts, repainting of parking, handicap spaces, and fire lanes to meet your city/state regulations. APSl is the Philadelphia/Camden expert, serving New Jersey, Pennsylvania, and Delaware. From the design and layout phase, to initial pavement marking and final application, our road and parking lot striping services ensure a quality look and feel that will immediately portray a positive image of your business, shopping center or facility. A clean and visible parking lot will maximize parking, allow easier navigation, and invite new customers to your business. For your parking lot striping project, we at Asphalt Pavement Solutions use airless sprayers to get the sharpest lines possible. Faster dry and hardness development. Paint: Less dirt pick-up, longer glass bead retention, improved durability. 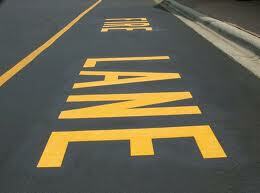 For sealcoated parking lots we use Hotline Fast Dry Latex Traffic Marking paint. 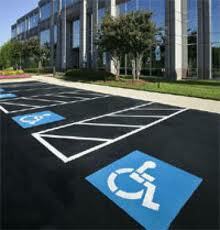 HOTLINE LATEX TRAFFIC PAINTS are very fast drying paints for use in marking parking lots, airports, and roads. TM2152 and TM2153 may be applied ambient airless or conventional, or may be heated for even faster dry. TM2152 and TM2153 conform to current VOC regulations and to the requirements of Federal Specification TT-P-1952D Types I and II, and dry to no pickup in less than ten minutes when properly applied at ambient conditions, or one to two minutes when heated to 140° to 150°F. High relative humidity has significantly less effect on the dry time of these products as compared to other latex traffic paints. Asphalt Pavement Solutions is an applicator and distributor of Sherwin Williams Traffic Paint! Contact us for your parking lot striping needs in the Philadelphia, Camden and the greater New Jersey, Pennsylvania and Delaware areas.